Martin, the greatest, the most lofty, the most permanent, the most original genius of his age. I see in him… the presence of a spirit which is not of the world, the divine intoxication of a great soul lapped in majestic and unearthly dreams. He has taken a range, if not wholly new, at least rarely traversed in the vast air of religious contemplation; he has gone back into the drear antique; he has made the Old Testament, with its stern traditionary grandeur, its solemn shadows and ancestral terrors, his own element. … Vastness is his sphere, yet has not lost nor circumfused his genius in its space; he has chained and wielded and measured it at his will; he has transfused its character into narrow limits; he has compassed the Infinite itself with mathematical precision… Alone and guileless he has penetrated the remotest caverns of the past, and gazed at the primeval shapes of the gone world." 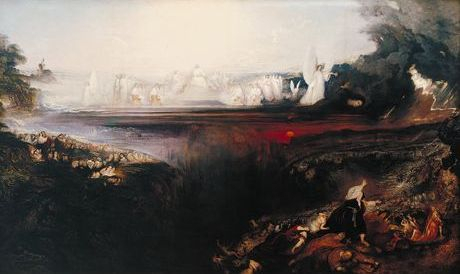 The Last Judgement [oil painting], John Martin, 1853. Tate Britain. 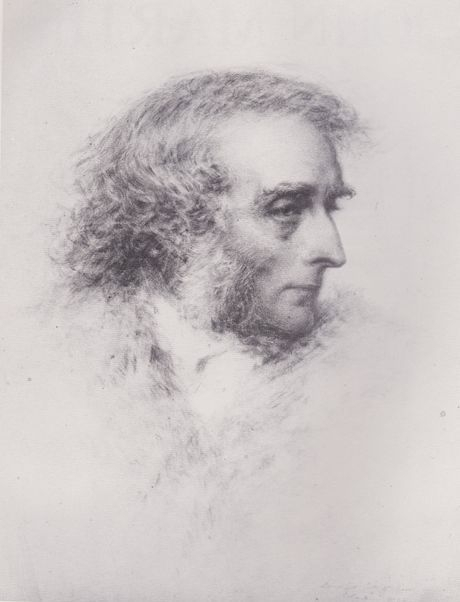 John Martin, Douglas, Isle of Man [chalk], Charles Martin, 1854.